Early on February 6th, 2010 on a quiet stretch of road in the community of Pemberton, B.C., just as the day brushes the last few flecks of night off of it's shoulders,it may be raining, or snowing, or cold and clear. But one things is for sure: There will be a flame. That flame, just six days and two hundred-ish kilometers to the South, will be touched to the Olympic cauldron, officially opening the Vancouver 2010 Winter Olympic Games. But before it gets there, for a few moments in Pemberton as that daylight takes hold, over a distance of 300 meters, that flame will be held in the hands of a woman by the name of Marion Lay. This otherwise quiet, secluded stretch of road will be transformed and take on new significance, if only for moments; paved over anew by the footsteps of a woman with an olympic-sized legacy all her own. Marion was born in and has lived most of her life in Vancouver, and she now lives part-time in Whistler, which alone makes her an ideal torch bearer given the host cities for the upcoming Winter Olympic Games. But it goes, well, well beyond that. At an early age, Marion was drawn to the water. She grew up poor, but gained a wealth of experience through sport. Despite training in the U.S, Marion was always, and is, a proud Canadian. 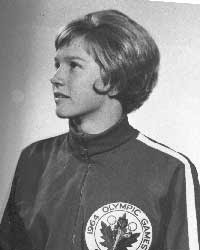 She swam for Canada in the '64 and '68 Olympics, at the ages of 14 and 18 respectively. Got a bronze medal, too, as part of Canada's relay team in those 1968 games in Mexico. She also picked up a gold medal at the Commonwealth Games. She's got a world record to her name as well. Marion's interests lay not only in the competition in the pool, but also in the competition for gender equality in sport. She is a founder of the Canadian Association for the Advancement of Women and Sport and Physical Activity(CAAWS) where her legacy remains felt years after her foundation in the form of the Marion Lay Herstorical Award, which honours the long-term positive influence of an individual, group or organization whose contributions have directly affected, improved or positively influenced girls and women in sport and physical activity. The list of awards Marion has been presented with is endless, from B.C. 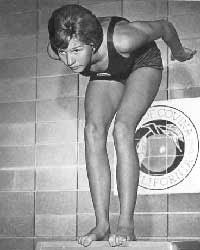 Sports Hall and Canadian Swimming Hall of Fame honours, right up to the International Olympic Committee's Trophy for the Americas, which she received in 2001 for her dedication to the advancement of women in sport. She's been involved in sport at every level. As an athlete, a coach, an administrator, as mentor, as visionary. And it's not just with swimming, nor Olympic competition. For example, a guy the rest of us all know and refer to (and revere) as Rick Hansen? Marion knows him simply as 'Rick'. She headed up operations for part of the 1985-1987 world tour. Ever heard of Pacific Sport Canadian Sport Centre Vancouver? One of the first established places that elite athletes could utilize to train on the West coast as they aim to own the podium, and yep, Marion helped found that, too. Heard of LegaciesNow? the organization set up to ensure that sport, art, and culture legacies would be of benefit to all British Columbians, and not just the host cities of the Olympics? Marion is the past President. But perhaps most important to this particular story about this years' Winter Olympics: Marion Lay has been part of the Vancouver 2010 bid from its earliest stages. It's not necessarily well know, but when the 1988 Winter Olympics in Calgary were ending, the road to Vancouver 2010 was already beginning. And Marion was there. Marion shared the dream early on that Vancouver would someday host the Games, and eventually, the 2010 Bid Corporation was born. She was even the Chair for a time. In 2002, she was elected to represent the City of Vancouver as a member of the Board of Directors for the Vancouver Organizing Committee for the 2010 Olympic and Paralympic Winter Games. Without Marion, it would all just be the same old road. The torch doesn't have to be on its way to Vancouver right now. That torch could just as easily be in some other corner of the world that outbid Vancouver for the games. But WITH Marion, and because of those like her, we.got.the.games. So, on Feb. 6th, 2010 that little piece of road in Pemberton will take on a new life. I could not be prouder or more thrilled as a Canadian, as a citizen of a host Olympic city, or as a human being who believes in the power and spirit of sport-- but most importantly as a family member of Marion Lay's--to say that I will be there to cheer her on. Hold that torch high Marion. You earned every step, and I can't wait to be there to watch you take them.